The Cr(VI) Mode of Action (MOA) Research Study was designed to understand how hexavalent chromium [Cr(VI)] in drinking water is associated with carcinogenesis in rats and mice. The project involved investigators from multiple institutions and conducted two 90-day drinking water studies, using one in the same mouse (B6C3F1) and rat (Fisher 344) strains used in the NTP study. The in-life portions of the study (i.e. the exposure, macro- and microscopic examinations, and some biochemical analyses) were conducted at the same research facility that conducted the NTP study to further minimize inter-study variability. Histological lesions, biochemical analyses, toxicogenomic analyses, pharmacokinetic analyses, and mutational analyses were examined in the target tissues of interest, i.e. the small intestine and oral mucosa, of the mice and rats. In addition, in vitro cell culture studies were conducted to further inform the Cr(VI) MOA. The Cr(VI) MOA Research Study used the same concentrations of Cr(VI) in drinking water as the NTP study and also included lower Cr(VI) concentrations, which are more indicative of possible environmental exposures, such as U.S. drinking water. A pharmacokinetic study (absorption, distribution and deposition of Cr(VI) in tissues in the body) to develop the data supporting physiological-based pharmacokinetic (PBPK) models. 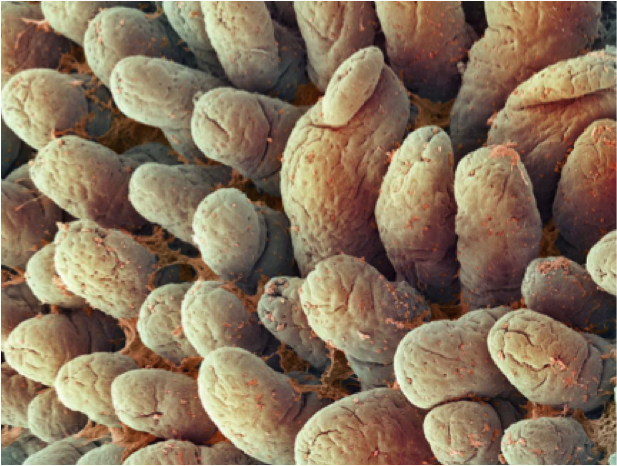 Scanning electron micrograph of small intestine showing villi and mucus to study cancer in Transgenic Mice & Rats from hexavalent chromium in Drinking Water.